Everything’s in position for efficiently using solar energy. The Sunny Home Manager offers all functions for seamless PV system monitoring, smart energy management and an integrated energy management solution, the SMA Smart Home. As a result, PV system operators have an overview of all relevant energy flows in the home. Using the individualized recommended actions, they can make decisions about when to use their solar power best. In particular, the Sunny Home Manager is key to automated integration of controllable loads and also serves as energy manager in storage systems with the Sunny Boy Smart Energy or Sunny Island. *Full range of functions is currently not available in all countries. Every residential PV system can be conveniently and seamlessly monitored with the Sunny Home Manager. After a simple commissioning procedure using the installation wizard, all basic functions are available via Sunny Portal. The PV system operator can use the live display to quickly get updated on energy home management. The data is updated every ten seconds, thereby playing a key role in helping to secure yield from the PV plant. In this process, the energy values for PV generation, purchased electricity and grid feed-in are registered from the connected power meters via various interfaces. Energy management in the SMA Smart Home is not a static and pre-defined process, instead the Sunny Home Manager looks around and thinks for itself. For example, it uses the local weather forecast to calculate how much solar power is expected to be available over the course of the day. Even more, the Sunny Home Manager learns the typical time at which household appliances are operated (load profile) and takes this into account in its calculation for energy management. The result: Thanks to the recommended actions provided, system operators receive guidance when and for how long they can use the solar power — optimally. For example, to start the washing machine. Thanks to this unique service, PV plants with Sunny Home Manager reach a higher level of self-consumption, which is specifically important in Germany. Furthermore, time-of-use electricity tariffs are considered, the system is well prepared for future changes of the electricity supply conditions. The Sunny Home Manager integrates controllable loads fully in accordance with the PV system operator’s individual requirements. Specifically, this means that common household appliances, such as washing machines or dishwashers, can be switched on or off remotely. This takes places either via the SMA radio-controlled socket for usual appliances or via data connection (Ethernet) for Smart appliances, i.e. for heat pumps from Stiebel Eltron, Tecalor or other white ware from Miele. This not only further increases self-consumption, but also helps users to record the specific load profiles of individual appliances, thereby helping them to identify electricity guzzlers. 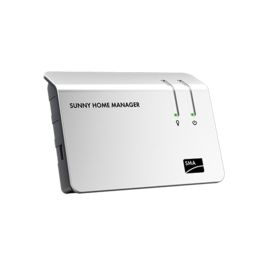 This is the hub for SMA’s intelligent energy management: The Sunny Home Manager is the control center for the SMA Smart Home. Besides the basic solution with Sunny Home Manager and SMA radio controlled sockets, also the SMA Integrated Storage System with the Sunny Boy Smart Energy and the SMA Flexible Storage System with the Sunny Island use the energy management features. With its “expertise,” the Sunny Home Manager ensures that self-generated energy is put to good use — in an optimal way to operate household appliances and store excess power in the battery for later use — or feed power into the utility grid when no other use can be organised. With the Sunny Home Manager, system operators are in complete control and can keep an eye on everything.